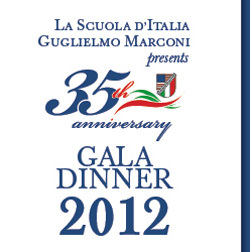 sono molto felice di avere l’opportunità di aprire il Gala 2012 della Scuola d’Italia Guglielmo Marconi. Non posso non cominciare in italiano perché – e consentitemi la nota personale — anche i miei figli Giampaolo e Serena hanno avuto la fortuna, come i vostri, di frequentare la Guglielmo Marconi. Questa scuola ha costituito per loro, per quattro anni, uno dei legami principali con l’Italia, quel legame che ha consentito loro di approfondire la cultura del proprio paese di origine, aprendosi a quella degli Stati Uniti. My presence here tonight is, first of all, a recognition of the commitment and dedication by the members of the Board of Trustees and, in particular, of its chairman, Stephen Madsen; of the Head of the School, Prof. Anna Fiore; and of the teachers. My sincere gratitude goes to the honorees – Anthony Bourdain and Michael White – and to our guest of honor John Turturro, for their support to the School of Italy. Each one of them, in his own way, is an explorer of that extraordinary world asset that we call “Italian culture”. To the students, families, sponsors of the school I say: you have made a wise decision by choosing this institution. 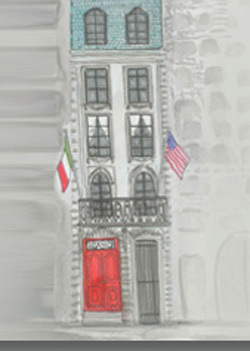 The “Scuola d’Italia” brings together the best of two education systems, the Italian and the American. It offers a true bilingual and a bicultural education. Its students have the unique opportunity to become virtual citizens of two Countries and cultures. This enables them to meet the demands of an increasingly interconnected world. Their well-rounded formation also reflects the shared values existing between Italy and the United States. This was solemnly confirmed not later than 2 days ago when the U.S. Senate passed a resolution celebrating the 150th Anniversary of Italy’s Unification and honoring the outstanding contribution of Italians and Italo-Americans to this great country, the United States. This is in the Scuola d’Italia’s true DNA. The School confirms its role as one of the mainstays of Italy’s projection in the United States. And it plays a crucial role in the promotion of Italian culture and language in America. This year, as you know, Italian at the AP level was reinstated in American schools. The Observatory of Italian Language supports the development of the program in collaboration with the College Board, and has created its own website (www.usspeaksitalian.org) what a great name! Its many activities include grants to be awarded to teachers of AP Italian. Now, after playing such an important part in the reinstatement of AP Italian, the Scuola d’Italia will once again be crucial in an initiative that we are planning to launch. 2013 will be the “Year of Italian Culture in the United States”, with a series of unique events throughout the U.S. meant to highlight Italy’s contribution to scientific and technological advancement and development through the centuries, starting with the Renaissance. So Renaissance and Artistic Tradition, and Innovation, as the pillars of our important initiative. So: “rooted in tradition open to innovation”. Exactly like the proud motto of our school. I am confident that, with institutions such as the Scuola d’Italia standing by our side, and with your support, this exciting new initiative in 2013 will further strengthen the excellent bonds that join our two countries and peoples. Thank you for your support to La Scuola d’Italia.